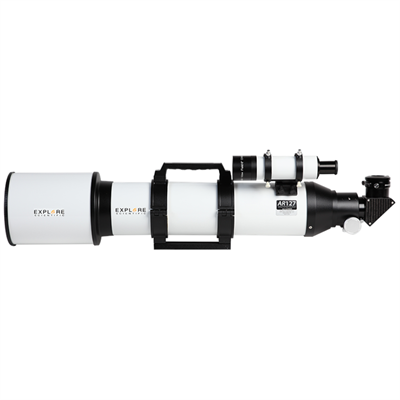 Designed to handle the rigors of public star parties and educational outreach, the Explore Scientific AR Series telescopes come with heavy-duty, high quality components, including a 2" dual-speed Crayford-style focuser, a one-piece 2" diagonal with 99% dielectric coatings, an 8 X 50 finderscope and quick release bracket, and a cradle ring assembly with Vixen-style dovetail mount. Just add a few eyepieces and the alt-azimuth or equatorial mount of your choice and you'll be ready to discover the Universe! Available in 102mm, 127mm & 152mm apertures. All models are f/6.5. The tube assembly is constructed from aluminum and stainless steel and painted gloss white. Enhanced Multi-Layer Coatings (EMD) are deposited on optical elements to boost contrast and eliminate light scatter. While refractors seldom require additional collimation after initial factory adjustment, the lens cell design allows for consumer collimation. Sending off to the factory is an option, but is not required. All models come with a heavy-duty 2" Crayford-style two-speed focuser. The heavy-duty 2" diagonal has 99% dielectric coatings for high contrast, bright images. A 1.25" compression ring adapter is included. Includes an 8x50 straight-thru finderscope with a wide 6° field of view. The front objective is focusable. To attach your Explore Scientific Air-Spaced Doublet telescope to a variety of mounts, we have included an extra strong extruded aluminum Cradle Ring Assembly and Universal Adjustable Mounting Plate. The "Vixen-style" plate fits mounts made by Explore, Meade, Celestron, Vixen & others. The classic air-spaced, crown-and-flint, doublet achromatic refractor is reborn with the aim to produce superior-class optical figure in a short (f/6.5) focal length design with Explore Scientific Air-Spaced Doublet AR Series. Whether you choose the AR127 model, you will be impressed by the stunning images revealed to you at the eyepiece, and all at a small fraction of the price you'd pay for a comparably sized apochromat refractor. Designed to handle the rigors of public star parties and educational outreach, the Explore Scientific AR Series telescopes come with heavy-duty, high quality components, including a 2" dual-speed Crayford-style focuser, a one-piece 2" diagonal with 99% dielectric coatings, an 8 X 50 finderscope and quick release bracket, and a cradle ring assembly with Vixen-style dovetail mount. Just add a few eyepieces and the alt-azimuth or equatorial mount of your choice and you'll be ready to discover the Universe! -The tube assembly is constructed from aluminum and stainless steel and painted gloss white. -Classic Crown & Flin Air-Spaced Doublet achromat optics. -Enhanced Multi-Layer Coatings (EMD) are deposited on optical elements to boost contrast and eliminate light scatter. -While refractors seldom require additional collimation after initial factory adjustment, the lens cell design allows for consumer collimation. Sending off to the factory is an option, but is not required. -Come with a heavy-duty 2" two-speed focuser. -The light-weight 2" diagonal has 99% dielectric coatings for high contrast, bright images. A 1.25" compression ring adapter is included. -Includes an 8x50 straight-thru finderscope with a wide 6° field of view, with front objective focus. -To attach your Explore Scientific Air-Spaced Doublet telescope to a variety of mounts, we have included an extra strong extruded aluminum Cradle Ring Assembly and Universal Adjustable Mounting Plate. The "Vixen-style" plate fits mounts made by Explore, Meade, Celestron, Vixen & others. Each AR127 is serial numbered and if registered within 60 days is protected with the Explore STAR Lifetime Transferrable Warranty.